Swine flu hysteria has led to these signs being posted at work. 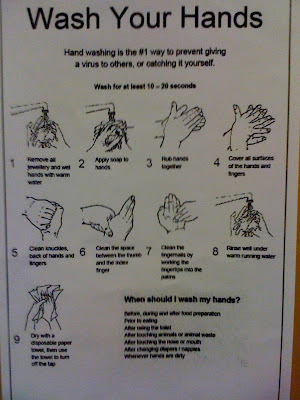 I'm posting it here just in case you've never washed your hands before. I haven't read the whole sign because when I get to the part about Remove All Jewellery - oh that's the 1st step - I disagree with it. I think you should leave your "jewellery" on. Otherwise your "jewellery" stays covered in germs and you put it back on your clean hands. Your "jewellery" needs to be washed too dude! Also in our building the printout is really blurry. Agree with bladio about the jewelry, but for a different reason: you remove your jewelry, it's gonna fall down the drain. Hmm ... bladio's reason for not removing jewelry makes more sense.